Eaton G Series Type EGB EG -Frame 3-Pole molded case circuit breaker is rated at 70-Amps and 415/480-Volt AC at 50/60-Hz frequency. The interrupt current rating of this circuit breaker is 18-Kilo-Amps at 415/480 Volt/25-Kilo-Amps at 240-Volt AC. It has non-interchangeable, LI fixed thermal-magnetic trip that opens the circuit to offer short circuit, ground fault and overcurrent protection for sensitive equipment. The 3-Phase circuit breaker comes with line and load terminal connection. It has a dimension of 2.99-Inch x 3-Inch x 5.5-Inch. 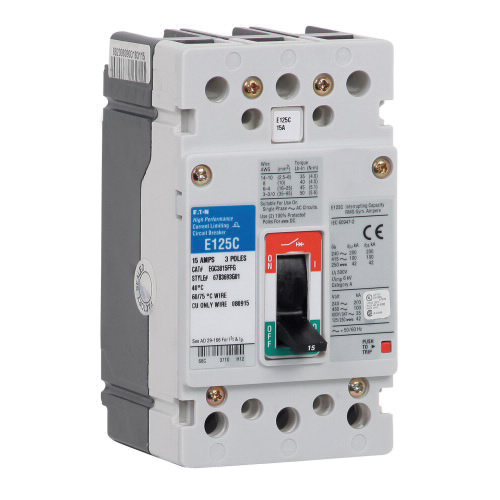 This circuit breaker withstands temperature rating of 40 deg C. Circuit breaker is UL 489 listed, CSA C22.2 No. 5/IEC 947-2, CE certified and HACR rated.